I was awarded the opportunity to attend the 2018 WICT Leadership Conference in New York City this year thanks to the generosity of WICT Philadelphia’s chapter scholarship. Being a first-time attendee, I was unsure what to expect— I had heard remarkable things about prior conferences and knew that WICT always delivers top-notch programming, professional development and networking opportunities. Looking back, not only did the conference meet my expectations, it greatly exceeded them. The welcome session featured a local NYC dance company called “Pretty Big Movement,” a full-figured dance troupe specializing in Hip-Hop, Jazz, African Modern dance and more. Their energy was incredible as they kicked the conference off to an exciting start by delivering a tribute to the Queen of Soul, Aretha Franklin. Several speakers including Maria Brennan, Marva Johnson and David Cohen delivered opening remarks. Being a Comcast employee, it was wonderful to hear Cohen communicate the company’s ongoing diversity efforts, and the fact that these efforts ultimately impact the bottom line. A self-proclaimed ‘numbers guy,’ he shared an exciting new statistic— over half the employees of the company (52%) report to a woman or a person of color. This is an incredible achievement! 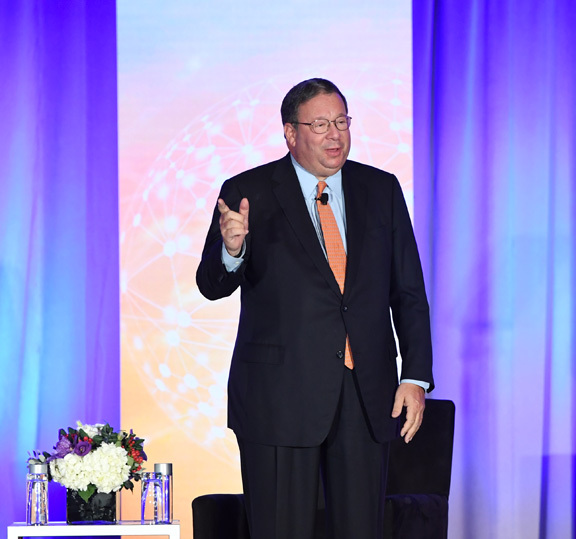 David L. Cohen, Comcast, speaks onstage during the WICT Leadership Conference. The last part of the Opening Keynote included a facilitated Q&A session with Bonnie Hammer, the chairman of NBCUniversal Cable Entertainment Group, and MSNBC’s Stephanie Ruhle, who prioritized WICT over her 9am show. (I’ve always been a fan, but this made me admire her even more!) In this discussion, one of the key pieces of advice that Bonnie offered was the importance of not only having mentors that give you guidance, but having “challenging mentors” that push you to your limits and witness what you are able to accomplish. The first breakout session I attended, and perhaps my overall favorite was “Win the Room: An Insider’s Guide to Confident & Compelling Communication” delivered by Matt Abrahams, a lecturer at Stanford Graduate School of Business. His interactive session captivated me from start to finish as he offered excellent tips with respect to presenting. One of his suggestions to avoid saying “umm” during your delivery, is to control breathing so that you end your sentences exhaling. (Did you know it is physically impossible to say “umm” while inhaling?) Additionally, he suggested trying a couple of things if you “blank out” during a presentation, such as repeating what you had just said, and/or posing a question to the audience to buy more time and gather your thoughts. He also advised recording oneself during a trial run in order to observe tone, speed, gestures, delivery, hesitant language like “sort of” and “filler” word count (the um’s, like’s and ah’s). During the Touchstones Luncheon, we heard from Carey Mulligan, an actress, and Zoe Kazan, a screenwriter/actress, who discussed their careers, touched on their personal lives and their current release “Wildlife.” Attendees also saw a preview of this acclaimed film. Also during the luncheon, WICT presented five awards to the industry’s most talented women: Kristine Faulkner, Izabella Wiley, Leslie Miles, Mary Campbell and Italia Commisso Weinand. Their contributions to both their company and the industry were significant, and each one had a personal congratulatory video from their respective companies and colleagues. In the afternoon, I attended sessions on building and maintaining an awesome personal brand as well as “Becoming a Corporate Athlete.” The latter session included a panel of athletes including Scout Bassett, Misty Copeland, Sarah Kustok and Lisa Wang, who shared motivating personal stories about how they overcame adversity to achieve their goals in life. Scout’s story was particularly moving. An amputee at a very young age, she had grown up in China, was adopted by US parents, grew up and realized she loved running. She was fitted with a prosthetic. Yet, she did not want anyone to know her “secret.” By overcoming over her fears, persevering and practicing, she ended up earning a full scholarship to UCLA and was selected to compete in the Olympics for the US Paralympic team. Truly an inspiration for all of us. The following morning began with another amazing keynote delivered by Joanne Lipman, the author of “That’s what She Said: What Men Need to Know (and Women Need to Tell Them) About Working Together.” She shared with us her experiences and research on gender equality and some humorous stories about her travels to Iceland and the fact that it is the most gender equal country. Can’t wait to read her book! Another highlight from the second day of the conference was the fact that I had the opportunity to participate in a one-on-one coaching session with Matt Abrahams, whose workshop I had attended earlier. We engaged for about 20 minutes on a few development topics that I chose, and I look forward to putting his suggestions into practice. This is an example of another great offering that I never would have been able to partake in outside of the conference!